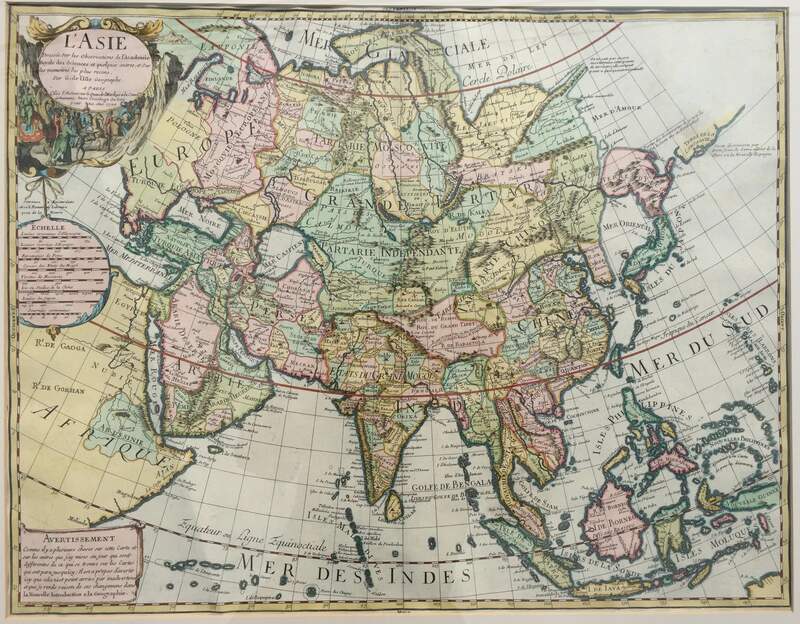 Antique map of Asia by De L’Isle titled ‘L’ASIE/Dressée sur les Observations de l’Academie/Royale des Sciences et quelques autres, et sur/les memoires les plus recens./Par G. de l’Ifle Geographe./A PARIS/Chéz l’Auteur sur le Quai de l Horologe a la Courone/de Diamans Avec Privilege du Roy/pour 20 Ans 1700′. A very attractive and rare early 18th century coloured map of Asia by Guillaume De L’Isle (1675-1726), one of the most respected mapmakers of 18th century France. A pupil of Jean Dominique Cassini the supervisor of the triangulation survey of France, and a member of the French Académie Royale des Sciences, Delisle was recognized as ‘the first scientific cartographer’ for his rigorous application of the scientific method to map making and critical approach to the maps of his predecessors. The first edition of this map was published in Delisle’s Atlas de Geographie around 1700. This later state or edition was published possibly around 1702-1705 and differs from the first edition in having detail of the coastline of north-eastern Siberia between Novoya Zemlya and Terre de Yeco.